Behind The Thrills | The world’s first launched wing-rider coaster launches this Saturday at Holiday World! The world’s first launched wing-rider coaster launches this Saturday at Holiday World! 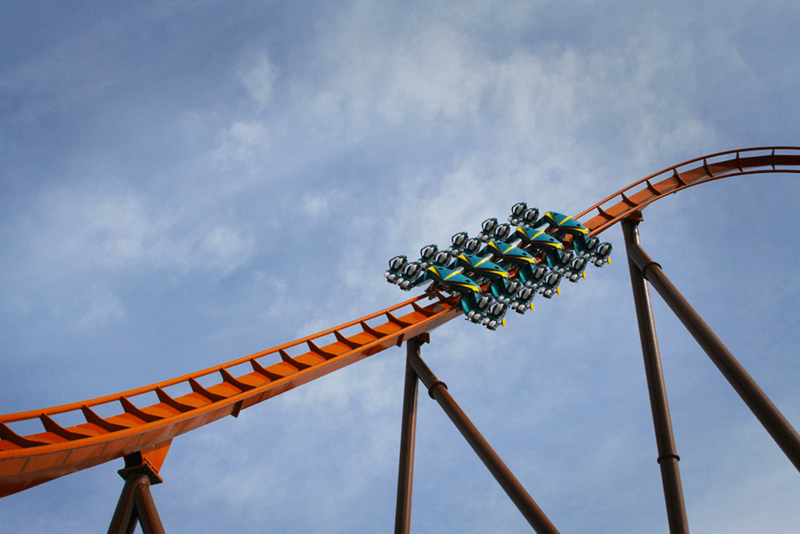 The world’s first launched wing-rider coaster launches this Saturday at Holiday World! Orange is the new track, are you ready to do launch? The all new Thunderbird at Holiday World in Santa Claus, Indiana is taking flight this Saturday as Holiday World opens for the season. The new coaster is a first in many respects, not only for the world, but also for the park. The park is breaking records, and starting a new tradition in the family park, something that hasn’t been done before. The new coaster cost the park an estimated $22 million dollars to build, and marks the single biggest investment in the park’s history. The steel coaster is not only the first launched wing rider coaster in the world, but it’s also the first steel coaster in the park that traditionally has wooden coasters. Thunderbird boasts a zero-to-60 miles-per-hour launch in 3.5 seconds, followed by multiple inversions – including a 14-story Immelmann loop, Zero-g roll, barrel roll, and a loop soaring 125 feet in the air. If the coaster sounds out of place in the park, it actually fits in perfectly. It’s nestled in the Thanksgiving section of the park, and keeps the tradition of hugging the terrain, winding through the park’s natural landscape, and even creating a few exciting moments where the coaster interacts with the existing coasters in the park. 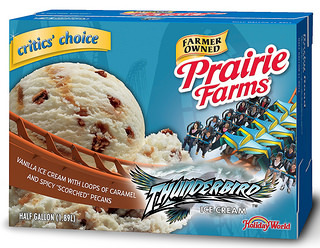 For those wanting to get a “taste” of the new coaster, you can pick up the special, limited edition Thunderbird Ice Cream. No, it doesn’t taste like steel, sweat and fear, but it does combine vanilla ice cream with loops of caramel and spicy ‘scorched’ pecans. It’s available in stores that sell Prairie Farms Ice Cream, and it will also be sold at Holiday World for the summer. Video-Watch Thunderbird launch at Holiday World! Thunderbird opens with Holiday World for the 2015 season on Saturday April 25th. For more information about Holiday World, including tickets, visit the official website by clicking here!